Nats fans have quite a few rivalries – right now the Braves are up there, as well as the Phillies. If the Mets get good again, we’d probably feel something there, and if Atlanta suddenly became terrible for a decade, that rivalry might lose it’s edge. But if there is a rivalry among Nats fans that will probably never die, it is Maryland versus Virginia. As someone who has lived in MD most of his life, and worked in VA most of his adult life, I’ve heard it plenty. Like many of these things, the differences are blown out of proportion to make a point, and people, no matter what their beliefs are way more similar than different. And both have areas with a population that would qualify as stereotypical people from the other state. Nonetheless, the rivalry exists, even if it is mostly in good fun. So in good fun, and with that rivalry in mind, I thought I’d come up with All Time All Star teams from each state, and pit them against each other. Since I don’t have a fancy computer program that can acutally do this, you’ll just have to imagine this has been simulated the requisite thousand times to give us a strong conclusion. I did this by place of birth, not where they grew up, because that’s how Baseball Reference has it listed. Hence Ryan Zimmerman, born in NC, is not eligible for VA’s team. I also tried not to include anyone who played the majority of their career before about 1890, give or take. That is when baseball really became the same game they play today, at least according to the great book, Where They Ain’t. First thing we gotta do is determine the starting lineups. 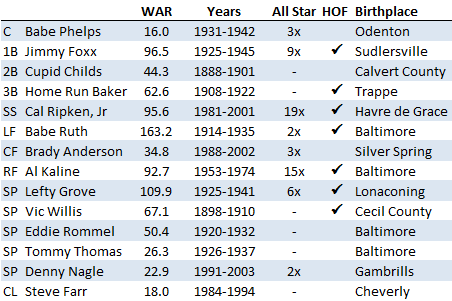 That’s quite an impressive list, with 7 HoFers. You may think of Babe Ruth as a right fielder, I certainly did, but I put Kaline there. Ruth played almost as many games in LF as in RF, while Kaline played about 80% of his games in RF. The Maryland bench is pretty impressive, too. 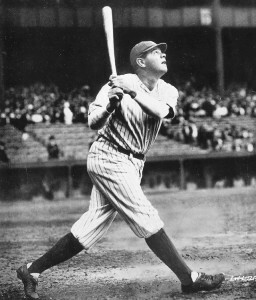 Honorable mention hitters (Pos/WAR) includes Mark Teixeira (1B/47.6), Bill Nicholson (RF/41.8), Harold Baines (RF/38.6), Brian Jordan (OF/32.7), plus Terps Charlie “King Kong” Keller (LF/43.0) and Buck Herzog (IF/27.4). They have one other pitcher that had an incredible career, Bobby Matthews (62.2), but his time spent with the New York Mutuals, the Fort Wayne Kekiongas and the Baltimore Canaries, as well as in the American Association, was in the 1870s and 1880s, so he’s out. They have a couple of other decent starters not chosen in Dave Foutz (22.7) and Geoff Zahn (20.7). Also deserving some mention is Allen Russell, the first pitcher that was turned into a full time reliever. This was done by Clark Griffith, of the Washington Senators, who then turned Firpo Marberry into the first star reliever. If I was to pick a name for this squad, I’d probably go with the Maryland Babes, due to their preponderance of guys with that name. The middle infield spots are taken up by 2 guys who were primarily shortstops, but I moved Hamner to 2B because he played almost a third of his games there. And the other candidate I found was Tony Womack, with his career WAR of 2.2. While VA might not have the stars of the MD team, they have a pretty good bench. Paul Hines (OF/44.5) and could have made the starting lineup, but his career was almost wholly before 1890. 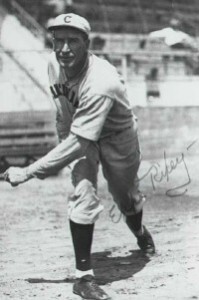 Also from the before the 20th century was Billy Nash (3B/33.1) and Steve Brodie (CF/19.1). Willard Marshall (RF/19.6), Brandon Inge (3B/19.0), Michael Cuddyer (OF/14.8), and B.J. Upton (CF/13.8) fill the bench out. I put Latos in as a SP over some other guys, like Jim Beattie (15.2), Bobby Witt (14.9) and Brian Anderson (10.9), because he’ll probably pass all of them in the next year or two. And let’s not forget Charlie Ferguson (6.6). Ferguson only pitched for 4 seasons, and it was in the mid 1880s, but his 183-170 record in that span stirred my inner Old Hoss Radbourn and made me include him here. I’d probably want to call this team The Virginia Granny Hammers, because at first glance I didn’t see that “n” in his last name and I thought that was the greatest name ever. Maryland certain wins on pedigree. They’ve got seven Hall of Famers to Virgina’s one (for now). Additionally, Babe Ruth isn’t the only “greatest player” on their team. Many consider Lefty Grove to be the best pitcher ever. As for total WAR with the starters, MD really dominates, scoring 939.6 to VA’s 379.8. Technically, VA could have scored more if I included guys like Hines or Nash, but it still wouldn’t have been close. Position by position, MD also tends to win, although VA is penalized for having active players, since WAR is a counting stat. At 30 years old, David Wright could potentially pass Home Run Baker at third base, and is putting together a HoF career. 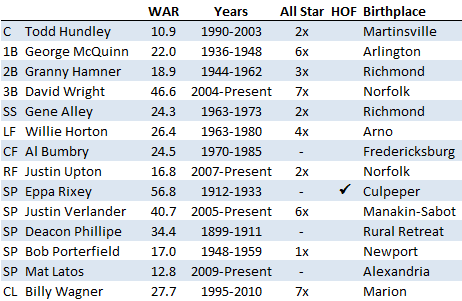 The chances of Verlander passing Grove are pretty tiny, but he’s got the Hall of Fame, and Vic Willis, in his sights. And at only 25, Justin Upton could have more than 10 years ahead of him – Al Kaline might be out of reach, but he could end up as the third best OF in this whole thing. To give the VA team a little additional credit, let’s talk about Billy Wagner for a second. He’s one of the best closers ever, with over 400 saves, and if he qualified (he’s about a season and a half short of the IP threshold) he’d have the second highest ERA+ ever, behind only Mariano Rivera. Despite a couple of high profile blown saves, he was a great player in his career, and you’d have to like VA’s chances to close out a save in the 9th over MD’s (unless MD decided to, you know, put in Babe Ruth or something to close it out). There is one advantage that Virginia does have. If you played this game today, they’d most certainly win, as many of their players are still active or recently retired, and many of Maryland’s players have long since passed away. Maryland takes this matchup running away, but this should probably be revisited in 20 or 30 years, as Maryland doesn’t produce the players it used to, and Hampton Roads is a hotbed of baseball prospects.